I should have been a mole " it feels so safe and cool and quiet to be underground. 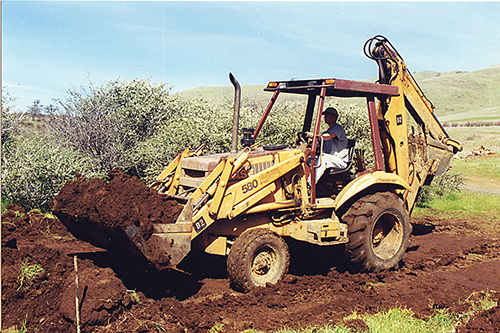 So when my house burned down 20 years ago and the backhoe man was on site digging new holes for foundation footings, I asked him to dig a 12x16x8-foot deep hole in the ground so I could build a large fire-resistant root cellar. I planned on using it mainly for storing all my photographs, negatives, CDs, videos, and 70 photo albums " from a lifetime of photography and videography. But it could also be used for a bomb shelter, hurricane safe-place, food storage room, or anything else a fellow mole might need " customized accordingly. 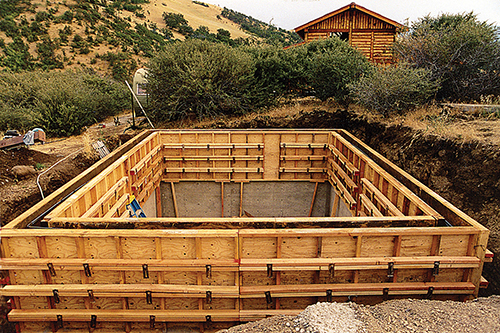 In our county, we can build a structure under 200 square feet without a permit (but no plumbing and wiring) so I started to research underground construction. I have a tendency to build everything even sturdier than code would require so I was determined that this cellar would be safe and sound and overbuilt like all my other projects. I first contemplated using pressure-treated lumber and treated plywood so I could work alone at a snail’s pace, but quickly changed my mind to using concrete instead, and got my good-natured boyfriend Kirt involved to help every step of the way. We were a team! First we leveled the bottom of the hole, laid 6-8 inches of gravel down, and leveled it again. 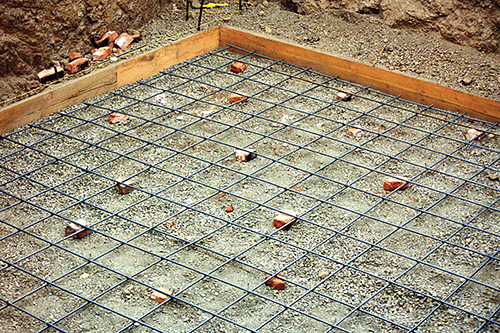 Then we set up a plumb, level, and square 2×8 frame around the perimeter, braced across the corners at 45 degrees, and pounded in spikes to hold the sides from spreading during the 8-inch-thick floor-pour. All around the perimeter on the lower inside of the 2×8 frame we fastened 2x4s laid flat with rows of holes drilled 16 inches apart down the middle to support the ...” rebar sticking up inside the yet-to-be-formed wall cavity and to keep it spaced in the middle of that cavity. Before forming up the walls, we also wired horizontal rebar to the verticals at 16 inches apart to create a 16-inch grid inside the walls. We strategically placed spacers on the gravel (half bricks) to hold the rebar up 2 inches off the bottom, and laid down a 12-inch grid of #5 rebar (...”). (We rented a manual rebar cutter to cut as needed.) Then we called Ready Mix to come up and do the pour. They recommended fiberglass be added to the mix to help protect against cracking at a later date, so of course I said yes and paid the nominal extra charge. 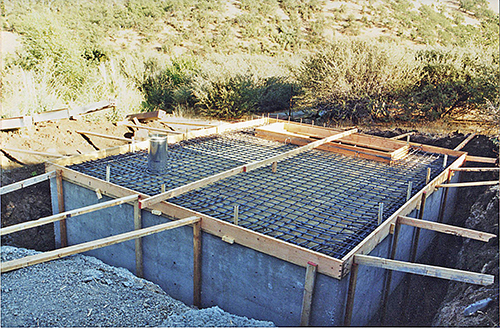 Once the floor was troweled, screeded, “floated” perfectly level, and had set up as hard as a rock, we built the wall forms (like pallets) out of 2×4 studs and 4×8-foot sheets of ¾” plywood and laid them down lengthwise so each pour would be 4 feet high. There is so much weight and pressure pushing out as the concrete is pumped in, so 4 feet tall is maximum for a pour. After the first 4-foot pour, we methodically moved the forms up and called for the second pour, to bring the walls up to 8 feet. (The forms came off easily because we had previously sprayed them lightly with Thompson’s Water Seal.) Then we snapped off all the protruding snap ties left sticking out of the exposed concrete walls by twisting them off using a piece of small diameter pipe long enough for good leverage. Before the second pour, we stuck a 2-inch PVC pipe through the wall as a conduit for a power cord later. After the second pour, we screeded the top 8-inch wide perimeter all around and poked in rebar every 3 feet or so for roof anchor bolts. Then we put a 1.5-inch diameter piece of pipe over each ...” rebar stub to create some wiggle room for the roof to move a little if it ever needed to, such as from an earthquake or just normal expansion and contraction from heat and cold. Our objective was to enable the roof to “float” independently on top of the walls. To prevent it from adhering to the walls during the pour we laid down an 8-inch-wide strip of tarpaper (30# felt) on top of the walls all around the perimeter. Note: An old retired water-tank builder from bygone days advised us to do this to prevent the “lid” from ever cracking. An ingenious trick of the trade. All went exceedingly well. We built the frame for the roof, and also framed in the opening for the stairs, and braced everything securely to prevent back pressure from bulging the frame out. We laid down plywood which was supported underneath by heavy duty scaffolding with adjustable casters cranked up firmly against it. To make the unsupported roof design extra strong, we installed a tight 6-inch grid of rebar held up off the plywood by “rebar chairs” this time (professional spacers are more accurate than half bricks). I cut a 12-inch hole in the plywood and put in a 12-inch-diameter wind turbine over to the side opposite the stair opening " for future air circulation " and then called for the 8-inch-thick roof-pour. 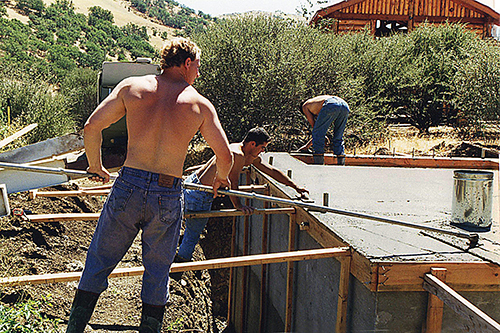 We spent quite a while screeding and troweling the final pour and finishing the surface with a “bull float” as perfectly as we could. Son Eric and friend Vadim rushed over to help; it was hot, and we had to hurry with the fine-finish work. When the roof was hard but still “green,” we pulled the short pipes off the rebar sticking up, then cut the stubs flush with a Sawzall, and caulked them with silicon to prevent rust. When all was done we sprayed the outside of the walls with a masonry waterproofing sealer, and protected them further with 1-inch rigid foam insulation, then called the gravel-shooter guy to come up and fill in the sides with gravel. 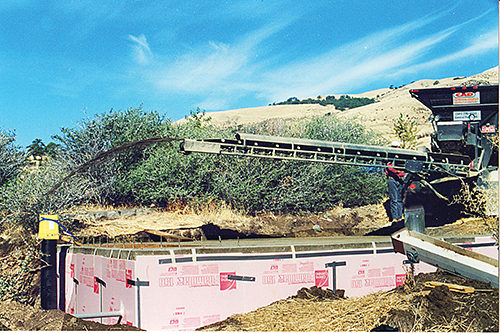 The company is called CAD (Conveyor Aggregate Delivery) and they do a great job of completely backfilling around a structure by accurately shooting the gravel from a distance, monitoring it by remote control. I don’t remember what the charge was but I do remember it was worth every penny! Before CAD arrived I put a 10-foot by 12-inch diameter black corrugated drainage pipe vertically down the wall on the lower side of the hill so if water ever accumulated we could lower a little sump pump 8 feet down the hole and pump it out. But in the past 20 years I have never had to do that. This particular root cellar has no drainage provisions except for a 4-inch-diameter perforated/corrugated French drain on the upper side of the cellar. It’s buried 12 inches and laid down in a big arc so it daylights on each side beyond the cellar. If it ever floods, I’ll dig a deeper trench. I built the 12-foot-long stair horses and 4-foot-wide stair treads from 2x12s and installed them at a comfortable angle of “rise and run” (8 inches in 11 inches). We dismantled the scaffolding and hauled it out up the stairs. Next, Kirt built a cute “little house” over the stairwell to match the other structures on the property, and put white translucent polycarbonate panels on the shed part of its roof to let light in. I made the board ‘n batt “hobbit” door for it, then carried on with trying to beautify the inside of the place. 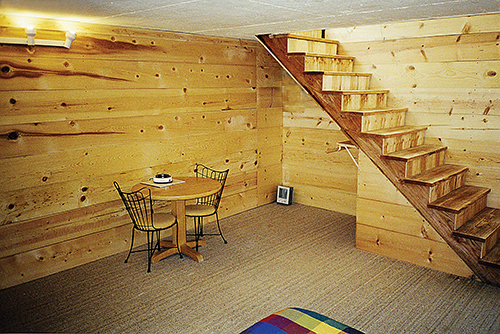 I lined the interior walls and ceiling with 1×12 small-knot pine boards run horizontally. I had to rent a concrete nail gun that used .22 caliber bullets to fasten the 2×4 vertical furring strips to the concrete. (Earplugs mandatory!) Then I attached the beautiful boards with nice looking screws, and snapped a few pictures. Once it got filled up I knew it would never look this clean and spacious again. I installed glue-down carpet, and temporarily moved a bed and a table and chairs into it for sipping coffee or taking a nap. 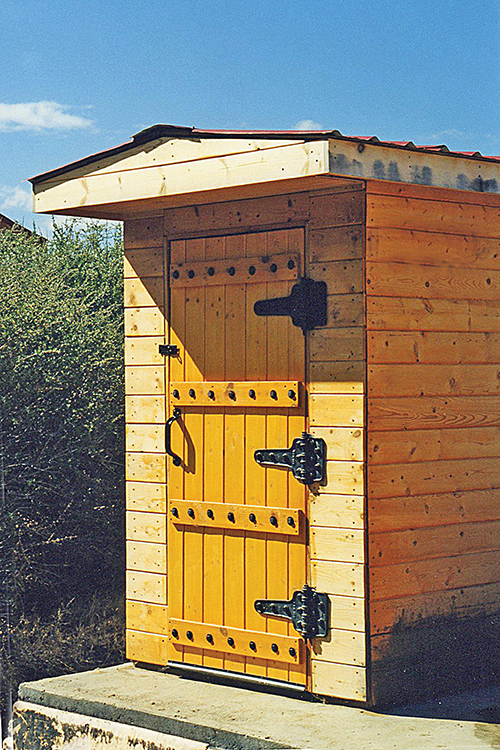 The completed root cellar took approximately 21 cubic yards of concrete, and two months to complete. I had to pay an extra pumping fee for the narrow walls because the barrel rig had to use a pump hose, but for the floor and roof they used a chute. 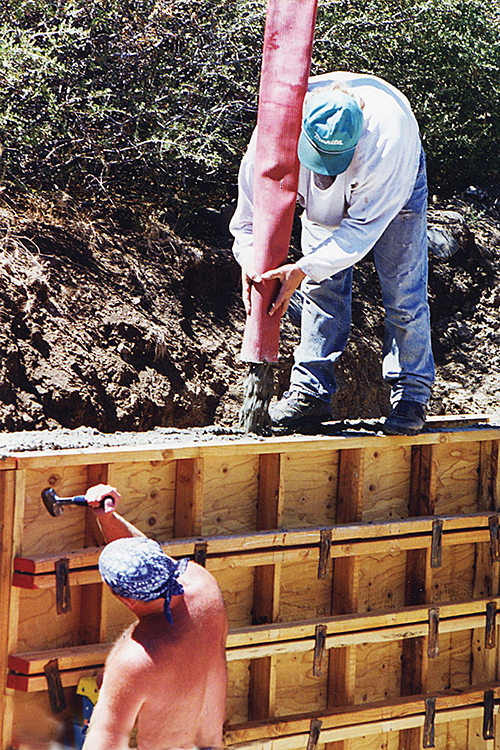 To calculate how many cubic yards of concrete you’ll need: multiply length in feet x width in feet x thickness in a fraction of a foot, and divide by 27 (27 cubic feet = 1 cubic yard). 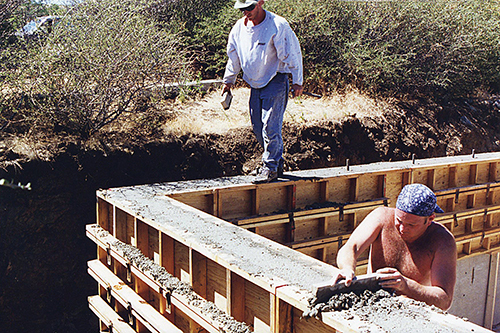 Nationwide, the average cost of concrete is now about $100/cubic yard. Twenty years ago it was $85 so it hasn’t gone up much at all. It’s still affordable! All told, the whole project did indeed cost $5,000 (concrete cost $2,000) and is a great addition to the property. I can escape down there when it’s either searing hot or freezing cold outside, and the temperature is between 50 and 70 degrees year round. Moles have it made. This article recounts how I built my underground room, not necessarily how you should build yours. The location and the construction details of an underground structure depend on the climate, rainfall, soil, water table, tree roots nearby, and drainage. There are many considerations before beginning a project like this. Do your research and consult local rules and regulations. 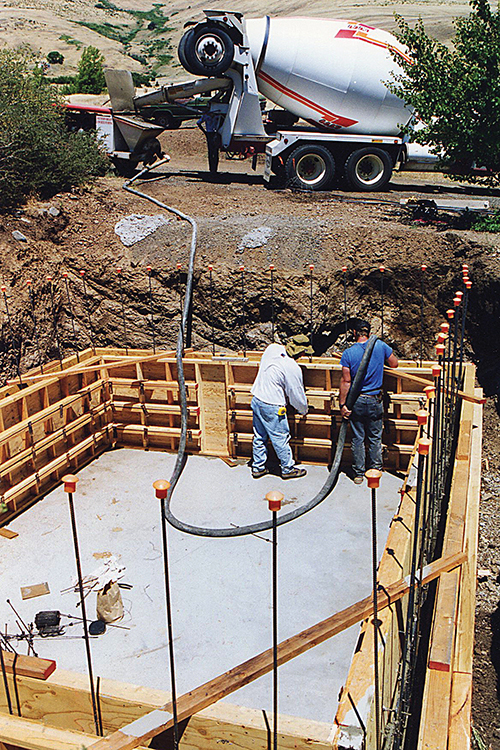 There are great websites (and books) that instruct and illustrate exactly how to build and set concrete forms. Happy burrowing! The House That Dorothy Built.